Apart from beyond all these work, we are also specialized in the work of Stevedoring n especially at the time of arrival of the vessels. By virtue of its strong local relationships and huge cargo volumes handled Apex Marinetrans Pvt. Ltd. is in a position to negotiate cost effective deals for its principals and propose the most reliable and efficient Stevedoring companies for smooth and fast cargo work. Mining the Wealth of the Nation. Our Group mines over 9 million cbm of Iron Ore and Coal per annum through various mines of Coal India and OMC & OMDC. Keeping the variegated requirements of our customers in mind, we are indulged in providing Stevedoring Service to our important customers. These Stevedoring Services are rendered as per the expectations of our customers. These services are delivered with the support of our team of diligent professionals on time. By virtue of our strong local relationships and huge cargo volumes handled by us, we are in a postion to negotiate cost effective deals for our Principals and propose the most relaible and effecient stevedoring companies for smooth and fast cargo work. We also have a panel of approved survey companies to render tally and supervision services in order to avoid claims and disputes. In the field of stevedoring, we are competent enough and equipped fully to handle multi cargoes such as salt, wheat, maize, illuminate ore, raw cashew, other general cargoes, project / heavy lift cargoes. The Company has been working as a stevedore at M/ s Adani Port Limited, Mundra for 11 years now. The Company has handled all varieties of cargoes with aplomb with a reputation of un-/ loading vessels at a very fast rate regularly. As Stevedores ESQUIRE SHIPPING & TRADING Pvt. Ltd. looks after all your labour requirements - for discharging and loading of your cargoes along side the berth and at anchorage. Our labourers work according to the regulations imposed by various bodies. They like us are motivated to provide "Service before self". Stevedoring operations for various types of cargoes such as bulk, break bulk, containers and projects. Shree Sagar Stevedores Pvt. Ltd.
We are one of the stevedores operating at all western ports. We handle all type of cargo i.e Bulk / Break Bulk (including Rice, Sugar, Coal, Soya, MOP, River Sand, Marble Blocks, Steel Coils, Pipes, Plates, Rods & Bars) Project Cargo including Heavy Lifts, ODC, Containers, Cryogenic Tanks etc. Stevedoring operations are executed and supervised by experienced and trained professionals. Sri Gayatri Shipping & Logistics Private Limited. With all bagged and break-bulk cargo, loading and un-loading is a crucial and time-bound service. Any delay or damage results in huge cost esaclations. we provide the best stevedoring facilites as licensed stevedores fro handling Import/Export cargo at Porbandar. By virtue of its strong local relationships and huge cargo volumes handled Shreenathji WorldWide Pvt. Ltd. is in a position to negotiate cost effective deals for its principals and propose the most reliable and efficient stevedoring companies for smooth and fast cargo work. 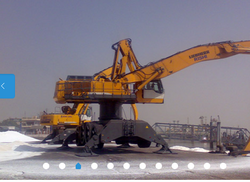 We offer Stevedoring Services throughout India.